A brand new beer from Bell’s. A wheatwine, no less, you don’t see that every day. I’m tired from work and class tonight and just watching a bit of classic Breaking Bad, so I can’t be bothered to set up the camera. Let’s do an old-school text review. Pours hazy yellow/orange, billowy white head. A bit like a hefeweizen, but at 8% it’s a bit big for a hefe. Then again, it’s a bit small for a wheatwine/barleywine. Aroma pulls even closer to a hefe. Quite estery, hints of banana. Maybe some bubblegum. Flavor follows the nose, tons of ester and a nice dose of alcohol, though no booze. Sweet. Overall I’d definitely call this something like an Imperial Hefeweizen rather than a wheatwine, although that’s just pendantic semantics. The back label mentions “the Wheat series,” implying that this is the first of many beers like this. It’s not phenomenal, but it’s decent. I’d drink it again, maybe on tap. Pretty standard special-ish releease for Bell’s these days. Yep, another really old review, from back when I had a real beard. This one was shot on 2013-05-01. The upshot? Very good, but not my kind of beer. I’m going to try to do at least one video a week going forward, and focus a lot more on talking generally about beery topics rather than straightforward reviews and tasting notes. I am always interested in new ideas for topics you’d like to see me discuss, so leave ’em in the comments! I did a video review for this one back in December, and found it a bit underwhelming. I bought a couple of bottles for trade and one to drink. Tonight, just for shits and giggles, I open this Founders 15th anniversary beer. 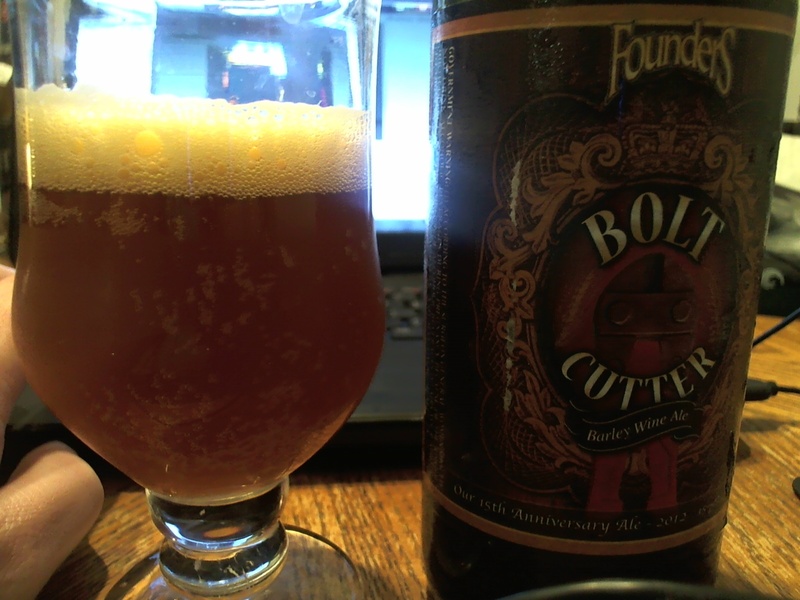 Founders Bolt Cutter with homemade glass. Pours very hazy, ruddy brown/orange, with a one-finger off-white head that dissipates quickly. It’s been at 60F or so in my house, and even after ten months or so I get some oxidation on the nose and flavor. It isn’t necessarily bad, even, that sherry characteristic helps to give the beer a bit of rustic complexity that keeps it interesting. Some herbal qualities present on the nose. After half an hour, I’m getting some citrus/pine notes that are likely coming from long-subdued hops, and a certain chewy spicy quality that’s probably some kind of yeast ester. Interestingly, the alcohol is incredibly well-hidden even as the beer gets up to room temperature. Is this a world-class beer? No. In fact, pretty much all of the Founders special releases in 750mL bottles have been disappointing on one level or another. But it’s pretty awesome stuff, and I’ll bet it’ll keep getting more interesting as it ages. If you’ve got one of these, feel free to open it now or save it for later. I’d love to hear thoughts from the peanut gallery if you’ve opened one recently.